In recent audio visual applications, including DVD or BS digital broadcasts, the sound signals are recorded using multi-channel technologies such as Dolby-Digital*1, DTS Digital Surround*2 and AAC*3. Such technologies are valued for their high-quality discrete sound capacities. The dynamic sound quality at movie theaters is made possible through the reproduction of these sound signals. However, in order to enjoy superb sound quality at home, six loudspeakers in total, namely, three in the front (left, center, right), at least two in the rear and an additional sub-woofer for the bass sound are necessary. When listening to music using conventional headphones, a sound image is established in a "fixed position in the listener's head". Thus, the listener is unable to feel the directional effect of the sound. Sony has developed its Virtualphones Technology (VPT) based on a research of human acoustics and integration of a wide range of technologies including headphone transducer technology*4, its proprietary audio analysis technology, and sound field reproduction technology using digital signal processing. VPT enables the sound image to be positioned outside the listener's head so that the sound field is created in a way that the listener can hear the sound equivalent to that naturally reproduced using 5.1-channel speaker system. With VPT, even with headphones, the listener can enjoy surround sound from discrete 5.1-channel sources such as DVD similar to what is possible with loudspeakers. Virtualphones Technology (VPT) is Sony's proprietary virtual surround technology that enables listeners to enjoy a movie-theater-like "live" surround sound. AAC is a multi-channel audio transmission format used for BS and terrestrial digital broadcasts proposed by the international standardization organization, MPEG. The official name is MPEG-2 AAC. AAC is an acronym for Advanced Audio Coding. A transducer is a device that converts energy from one form into another; i.e. headphones and speakers convert electrical energy into acoustical energy and microphones convert acoustical energy into electrical energy. When a human-shaped microphone called a dummy-head microphone is used to record 2-channel stereo sound, the sound reproduced does not remain within the listener's head (the sound image is not established in a "fixed position in the head"), bringing an enhanced sense of a live presence. This technology is called binaural recording/reproduction*5. Recognizing the potential of this technology, Sony continued research and development in this area. In parallel, Sony made a number of proprietary technological developments. Among them was a signal processing technology that incorporates the head-related transfer function (HRTF), which indicates the characteristics from the sound source to the listener's ears, using digital signal processing and head-tracking technology*6. As a result, in 1994, we introduced a first-of-its-kind innovative headphone system VIP-1000 ("Virtualphones") that gives the listener the sense that he/she can hear two front L,R speakers, even from a regular 2-channel stereo source. 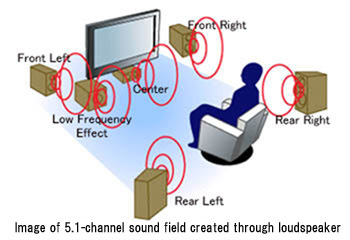 Later, with the development of DVD, the number of reproducible channels was increased to 5.1 channels (FL, C, FR for the front, RL, RR for the rear and LFE for the heavy bass sound). As a response, in 1998, Sony launched the world's first surround headphone system MDR-DS5000 that can reproduce 5.1-channel life-like sound with effects equivalent to the sound transmitted through six loudspeakers. These headphones using VPT are the integration of Sony's research on human acoustics, transducer technology*4 and sound field reproduction technology using digital signal processing. Research of these elemental technologies has continued and improvements are constantly reflected in the products. Some examples of progress made in elemental technological research are as follows. 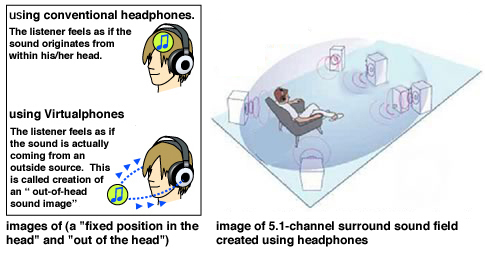 In the field of human acoustics research, the relationship between the reflected wave from the headphones and the "fixed position in the head" and the enforcement effect of the image of the fixed position in the front caused by waves reflected from the walls around the sound field have been clarified. Regarding transducer technology*4, we developed the XD Long Stroke Driver Unit which provides immersive close-to-live movie sounds and more dynamic bass sound and commercially introduced as MDR-DS3000 and MDR-DS4000. Moreover, in the area of sound field reproduction technology, head-tracking technology*6 was enhanced to 5.1-channels enabling us to introduce MDR-DS8000, a wireless surround headphone system with 5.1- channel tracking to the market. We continued to expand the world of virtual sound by reproducing diverse range of surround sounds that match the needs of different software and sound sources. For example, in the field of playback audio recording format, we have built-in decoders for formats such as Dolby Digital, DTS, Dolby Pro Logic II, MPEG-2 AAC, DTS-ES 6.1-channel surround. In the area of wireless transmission systems, Sony developed its original "Digital Infrared System" to replace the conventional "Analog Infrared System" and equipped this technology in its MDR-DS4000 and MDR-DS8000. This resulted in a reproduction capability of wider dynamic range and less transmission noise. In addition, Sony developed the "2.4GHz Digital Wireless System" which has a wider interference-free reception bandwidth, and incorporated this technology in MDR-DS6000. VPT is not limited to stand-alone surround headphones but is also widely used in different types of Walkman personal stereo under the name, "VPT Acoustic Engine". With the Walkman personal stereo system, using algorithm suitable for 2-channel stereo reproduction and choosing the appropriate sound field data, this technology allows listeners to enjoy dynamic sound even in an outdoor environment. Sony strives to make further progress through continuous research and development on various elemental technologies related to VPT.